Having been away for a couple of months, it was nice to make steps towards settling back into life in London again. My first foray back onto the London dining scene was to the ‘gastropub’ The Oak on Westbourne Park Road in Notting Hill, which turned out to be a far more pleasant experience than another first, one that involved going back to the gym (ouch). Other than the usual starters, mains and desserts, The Oak also offers a selection of ‘small eats’ and antipastas, but they are probably best known for their wood fired pizzas. 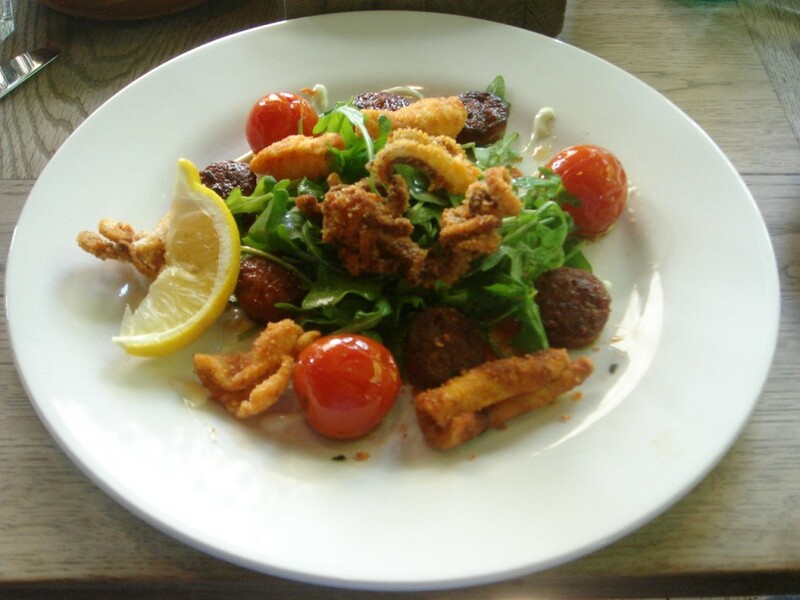 We started with paprika deep fried squid with rocket, chorizo, aioli and cherry tomatoes (£8.50), and chargrilled octopus with San Marzano tomatoes and rocket (£9.25). 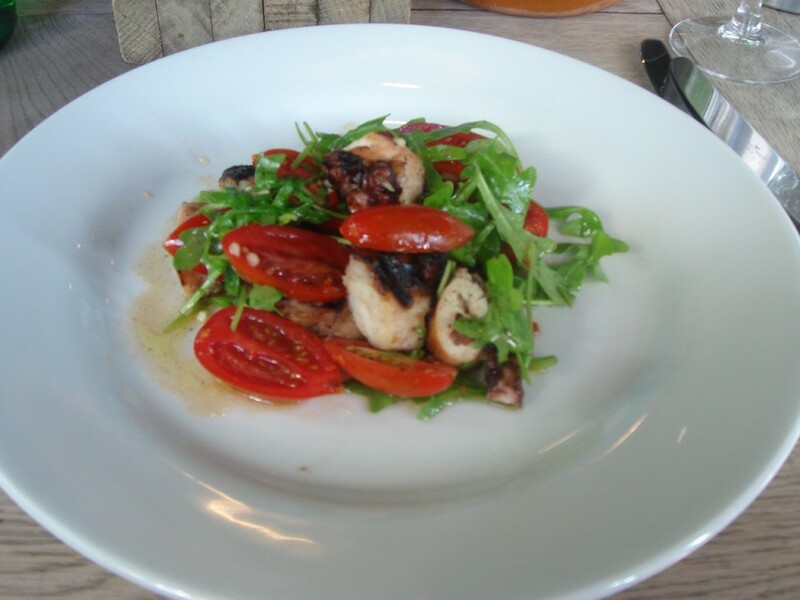 The accompanying salads were lovely and fresh, although the squid was slightly overcooked and chewy, and the octopus was extremely soft and limp – a firmer texture would have been more appetitising. 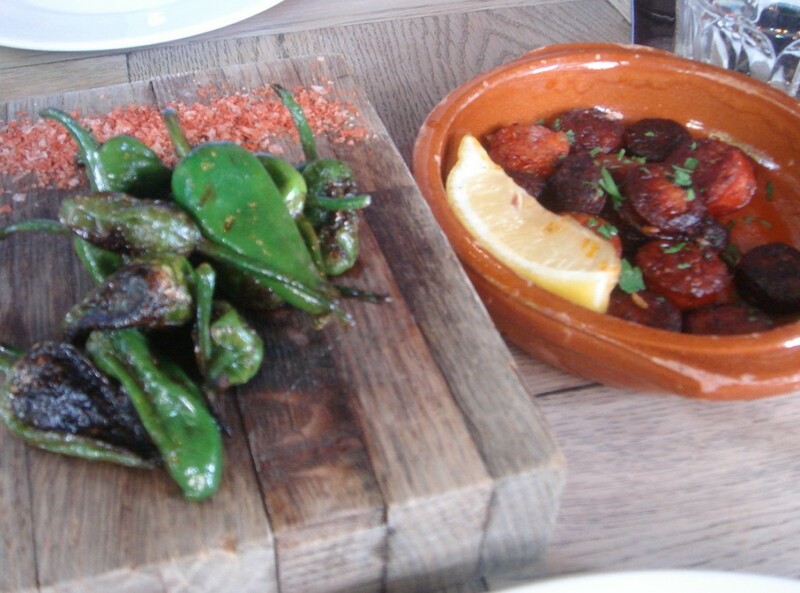 We also selected a couple of items from the small eats section of the menu – some Padron peppers with smoked paprika (£4.75) which were quite flavoursome but would have been better with a little more salt, and sautéed chorizo with fennel seeds and lemon (£5.25) which were meaty and delicious. 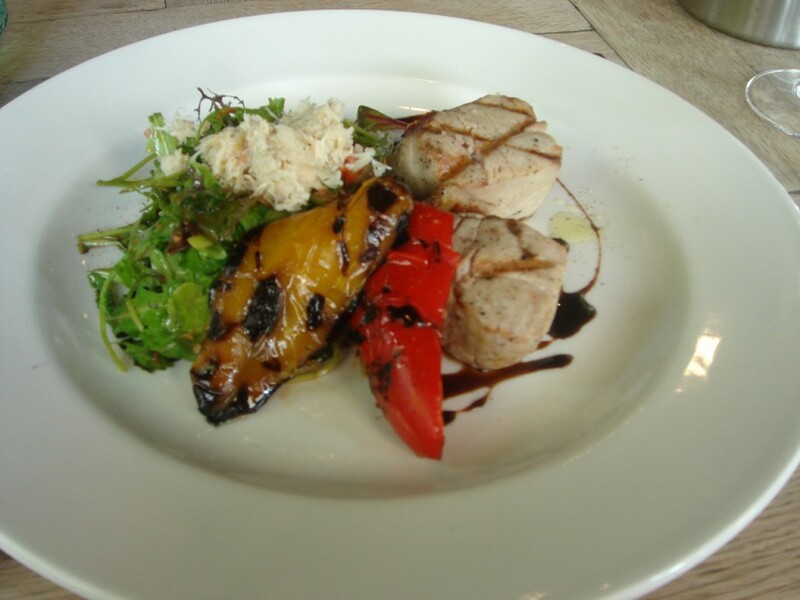 To mains, and I ordered the chargrilled tuna with roast peppers, mixed leaves, chives, verbena, basil and crab and salsa agrodolce (£15.75). The tuna, which was cooked medium (I ordered medium rare), was a little dry, but the accompanying salad was again excellent. The verbena added a tangy zing to the salad already made aromatic from the basil. The crab agrodolce was also highly enjoyable. 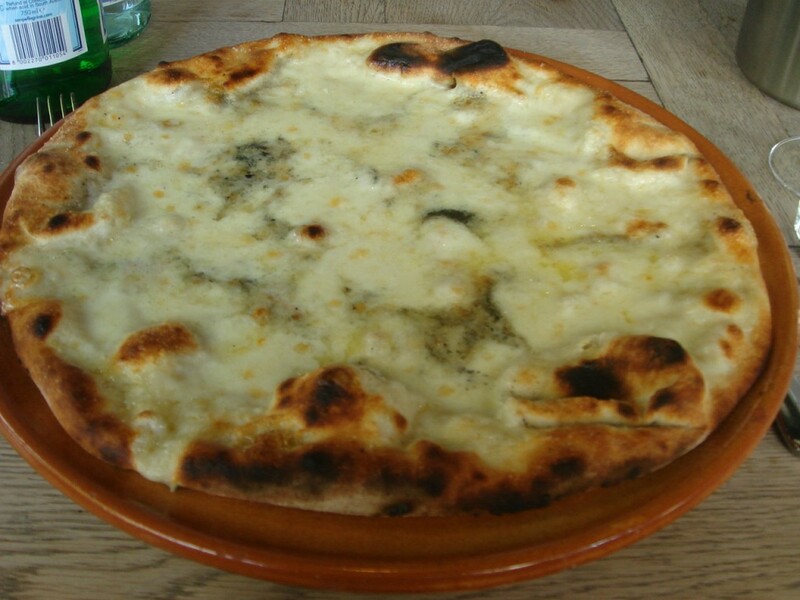 My companion’s Quattro formaggi pizza (£12.50) (the four cheeses were Picos de Europa, Napolean (Espoisses), mozzarella and parmesan) was fabulous. The wood fire technique was done to great effect for the pizza base was wonderful – crispy on the outside and soft in the middle, and there was a nice balance of flavours between the four cheeses. 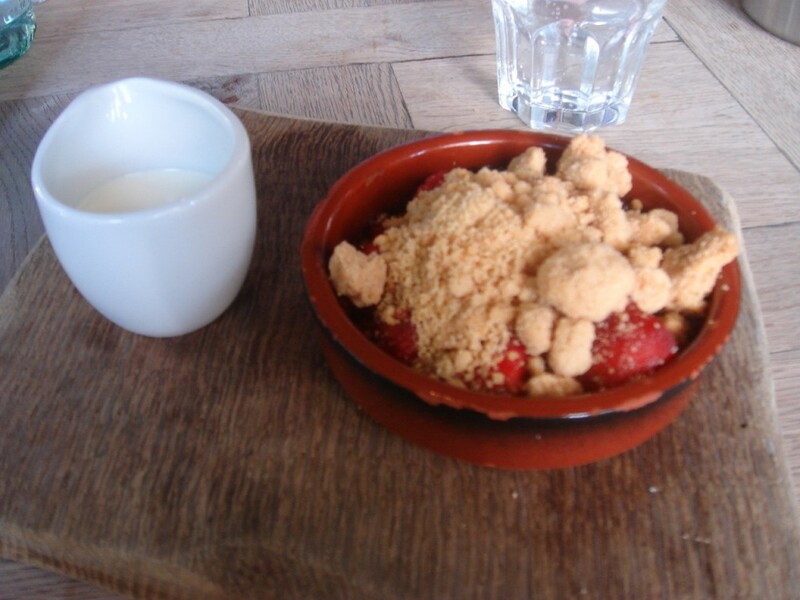 A dessert of apple, raspberry and blackberry crumble with cream (£6) was disappointing. The fruit was quite firm, and more stewing would have created a softer, melt-in-your-mouth consistency. As for the crumble, it wasn’t crumbly, but resembled a hard cookie instead. 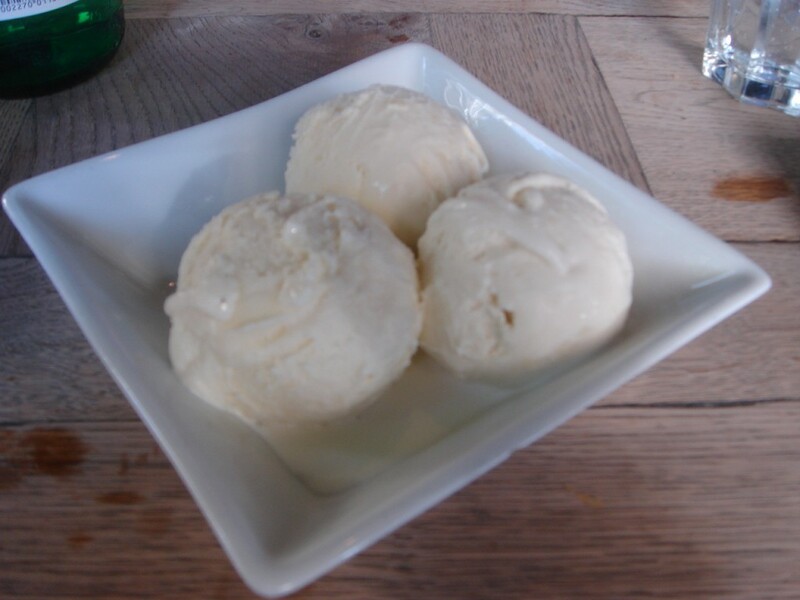 Ice creams (£4.50) of white chocolate and hazelnut were pleasant. The pizzas were the best of all the things that we ordered and during our meal I was sorely tempted by the suggestion of my dining companion to order another pizza. The idea was made all the more enticing by the smell of truffle oil on the pizza at the table next to ours (a zucchini and truffle oil pizza (£12)). But common sense prevailed and I managed to refrain (we didn’t need that much food), although I wouldn’t have been able to say no had he offered me another piece of his four cheese pizza. The salads were also lovely and the nibbles were quite appetitising. There’s a pleasant, buzzy vibe at The Oak, and although the timing of the food service was a little slow during our meal the service was very friendly, so overall it’s a worthwhile destination for a casual meal. Unfortunately I cannot comment on the meat dishes as we didn’t try any, but as I wasn’t entirely enthralled by the seafood and the desserts, I would probably avoid these and stick with the pizzas and salad type dishes on a repeat visit. 1) The Oak permits BYO. 2) Don’t forget that the inaugural 2009 London Restaurant Festival starts tomorrow and runs until 13 October 2009. For details of all the events, click on this link. 3 courses from £22 to £35 – excludes drinks and service. I have to say I am a little confused about this. So the squid was rubbery, the octopus was limp, the padron peppers are clearly burnt and the desserts were disappointing but yet you say that it’s worth a visit? I’m not being deliberately confrontational here, just in need of a bit of clarification! Not confrontational at all. I am happy to clarify. You are right on all the points you mentioned in your comment – the squid was chewy, etc. But what I also said was that the pizzas were excellent and I tried to elaborate on this point. The salads were also very good. So what I was trying to say was that as far as casual dining goes, you can have a nice meal if you choose certain items and not others. In my concluding paragraph I suggested sticking to pizza and salads and avoiding the seafood and dessert. It is a shame that a restaurant doesn’t always get all aspects of the food right but hopefully for someone who chooses to eat at The Oak, they will have a better idea of what best to order. It would have been a shame to disregard the restaurant entirely when some of the things they do they do really well. Thanks, that does help. Perhaps they should turn into a pizza place! I must say, interesting choice of cheeses on the pizza. They recently lost their licence here for about two months, choosing to offer an almost ‘all you can drink’ option on a reduced list of beers, wines and spirits for a ‘donation’ of £5. Sadly (for us) that is now elapsed!